It isn’t often my son has a big, happy reaction to something. Happy reaction being the best description. My son is a very sweet, imaginative and smart little boy. The loss of his mother, though, hit him really hard. It’s been three years and that loss still has a shadow that hangs over his life. I can only imagine, though the loss hit me hard, too. Since that loss was, for me, my partner, friend and wife, the loss is different for me. For my son – for all my kids, for that matter – the adjustment isn’t an easy one. We do a lot of things differently than we did three years ago and that’s by necessity. At the very beginning I tried to do things like we always had. The result was the fact that our house was constantly a mess, in constant disarray and I felt completely inept caring for my kids. Since then, though, we’ve been able to hit a kind of stride. I redecorated the house slightly. I removed old decorator items that were constantly in the way and didn’t match what I wanted. I cook the meals, I do the laundry. But making those adjustments helped me to…well…adjust, for lack of a better word. That doesn’t do it for my kids all the time. My son has some difficult issues to overcome. He doesn’t like dealing with the fact that he lost his Mom. As a result he is very self-conscious as well. He has a sore on his arm that is healing and that makes him very nervous. He wears long-sleeved shirts and puts a jacket on in the morning. I tell him no one will notice, it’s nothing too big or bad. When he got kicked, accidentally, in the eye he got a black eye and was worried. It wasn’t about how he looked he didn’t like how people looked at me with a disapproving eye. In the end, I realized it made him feel better and I let him wear the coats and shirts with the caveat that he changes to short sleeved if it gets too hot. But being sort of geeky about the television show Doctor Who my kids will watch any episode – even the scary ones – over and over again. They have their own sonic screwdrivers, a device the hero of the show owns. So when I saw a random t-shirt of a villain from the show, whose key, scary, intense line is one word: “EXTERMINATE!”, I bought it. They had one shirt left, and it had to come from England. I looked at him, rubbed his head, and smiled. It’s a long way he’s come from three years ago…when he was too shy and too sad to stand out. He just wanted to fade into the crowd. Now he’s letting his geek flag fly and walking around with a t-shirt of his favorite show. The smile never left his face the entire evening. When I tucked him into bed he had the shirt laid out and ready to wear. I hugged and kissed them both and told his brother that I’d get him a different shirt later. This, after all, was a big step. Yes…we’ve got a long way to go. But it took an exterminate shirt to show me how far we’ve come. I am amazed you stumbled on my little corner of the Info Superhighway, Marie-Eve! You have no idea how much my son loves that shirt! I am washing it every few days because he wants to wear it. 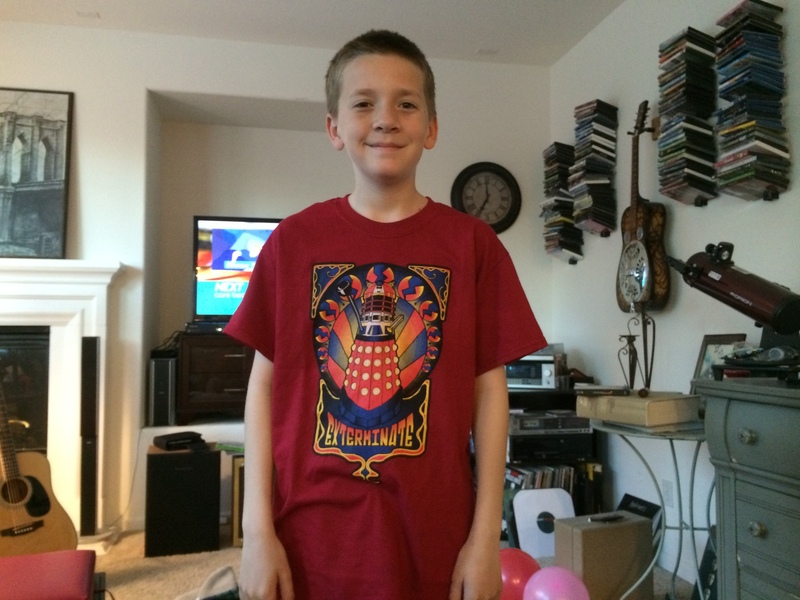 When his grandparents visited he wanted to show that over the shirt I bought him at the 50th anniv. screening at the theaters. You truly brought a very bright light to his eyes with that shirt and its design. Thank you so very much!